Honour killing is not new. Nor has it been, historically speaking, peculiar to non-Western cultures. In the seventh century BC, Rome was at war with the neighbouring city of Alba Longa. It was agreed between the warring parties that the outcome of the contest would be decided by a battle of picked champions. The champions were unusual: two sets of triplets, the brothers Horatii on the Roman side, and the brothers Curiatii on the Alban side. The Horatii won, although only one of the brothers survived. Horatius brought home his spoils in triumph, but upon seeing him, his sister broke out into lamentations. As it turned out, one of the dead Curiatii was her fiancé. 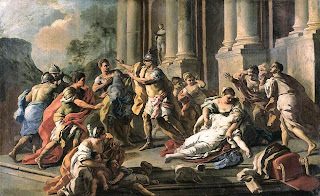 Enraged that she rained on his parade, Horatius slew his sister on the spot, proclaiming, “So perish any Roman woman who mourns the enemy.” He was condemned to death for the murder, but was let off after his father appealed to the people. It seems that the Roman people did not altogether disapprove of Horatius’ conduct. For form’s sake, the family were required to expiate the crime by performing certain sacrifices. As the old saying goes, “The Holy Roman Empire was neither holy, Roman, nor an empire.” In a somewhat similar vein, one could say that honour killing is neither done by someone honourable, nor necessarily done to someone honourable, nor does it really serve to restore lost honour. As such, it is a puzzling term. Not only is it puzzling, but some would say that the term obscures what is often really going on when someone kills a — usually female — relation who has supposedly shamed the family. I was led to some reflections on “honour killing” by an interesting exchange I heard recently on a radio program. One of the participants in the discussion was making the case that we should stop thinking of the phenomenon in terms of “honour killing” and instead view it under the category of “violence against women”. To a certain extent, one can see her point. After all, most honour killing does tend to be perpetrated against women. She was also concerned that the concept of honour killing, as portrayed in the media, tends to vilify immigrant communities, particularly Muslims — a group already labouring under unfair prejudice by much of mainstream North American culture. Again, point taken. Furthermore, many so-called “honour killings” have little or nothing to do with honour at all. Rather, “honour” provides a convenient pretext for disputes over money and property. Again, I don’t disagree with her point. However, honour killing of women is quite different from, say, “run-of-the-mill” North American spousal violence in at least one crucial respect. Much like in the story of Horatius, an honour killer’s reprehensible action too often garners the (tacit) approbation of his community. Horatius' father defended his son's action, and in two recent local cases of honour killing, sons assisted fathers in murdering female relations. As long as there is broad cultural support — or at least nodding indulgence — of the practice, these men will lack a certain external source of restraint on their behaviour. On the other hand, North American wife beaters do not normally garner our support. They are correctly seen by most right-thinking people for the brutes they are. And they certainly do not get assistance from other family members. If mainstream society treats honour killing as plain violence against women, our disapproval of the act is directed only at the perpetrator himself; the minority community may still indulge the practice. But by treating it as a culturally-embedded phenomenon, we are enabled also to direct our disapproval at those communities that lend support to it. If those communities wish to avoid such disapproval, they will have an incentive to enforce new internal norms that forbid the practice. Only once this is achieved can honour killing be treated as violence against women as such.